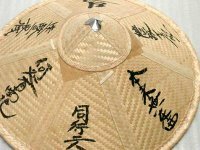 For the traveler in the Edo period, a large hat was a protection against rain and shine.
. WKD : Hat, strawhat, straw hat and more (kasa 笠) . 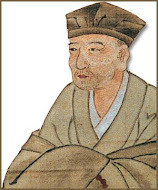 This is another expression used by Basho to describe the outfit of the farmers and travelers. usually made from bamboo and oiled paper in the times of Basho.
. WKD : kasa 傘 umbrella (for rain or sunshine) .
. izuku shigure kasa o te ni sagete kaeru soo .
. karakasa ni oshiwake mitaru yanagi kana .
. furazu tomo take uu hi wa mino to kasa . "In a comic style reminiscent of the speech of a kyoogen (comic drama) actor, the speaker offers to sell a hat piled with snow. Such a hat is priceless to the poet, who prizes snow, a major object of poetic beauty, but worthless to merchants dealing in material goods. In a haikai-esque inversion, the useless becomes valuable." This haiku appears in "The Records of a Weather-exposed Skeleton"
(1684). It was written in Nagoya, where Basho attended a snow-viewing party. "Oi nikki" (1695, edited by Shikoo) gives the following version.
. Enomoto Kikaku, Takarai Kikaku 宝井其角 . This is the only hokku where he uses ikameshii, so it must have been quite frightening and special.
. inochi nari wazuka no kasa no shita suzumi . Written in 貞亨元年, Nozarashi Kiko, on the way to Atsuta. He was surprized by a sleet shower on the road. 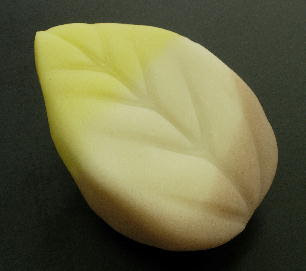 shigure 時雨 is not simply a kigo for winter, it also expresses the important "fuuryuu 風流" furyu - "poetic elegance" in Japanese poetry. ko wa nan to - short for nan to nan to shows his great way with choosing words. Bashō's (Death) Anniversary / Basho's Memorial Day .
. Kasa-dera ya moranu iwaya mo haru no ame . Temple Kasadera Kannon 笠寺観音 in Nagoya - with a legend about the KASA.
. Kasajima wa izuko satsuki no nukari michi. Basho is making his way into the mountains of Yoshino, usually famous for the sakura blossoms in spring.
. Kasuya Chiri 粕谷千里 . .- Hayashi Tooyoo 桐葉 Hayashi Toyo - .
. kyoo yori ya kakitsuke kesan kasa no tsuyu .
. Musashino ya sawaru mono naki kimi ga kasa .
. tootosa ya yuki furanu hi mo mino to kasa . 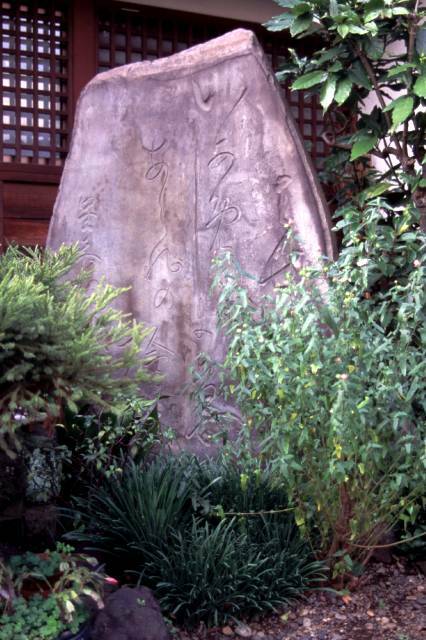 the Beauty Komachi on a grave marker.
. uguisu no kasa otoshitaru tsubaki kana .
. wakareba ya kasa te ni sagete natsu-baori .
. yamabuki ya kasa ni sasu beki eda no nari .
. Yoshino nite sakura mishoo zo hinoki-gasa . I only stay at home and struggle with toils of this world. Should I do this? Should things be like that? So I think, but I fail to carry out all that I have planned earlier. In the end, even though the examples of [people] losing interest in landscape, birds and flowers are the common state of the world, I feel as if I am the only one so stupid, and I am ashamed to see others.
. WKD : Hat, strawhat and more (kasa 笠) .
. Hinoki cypress - Chamaecyparis obtusa .